Hi! 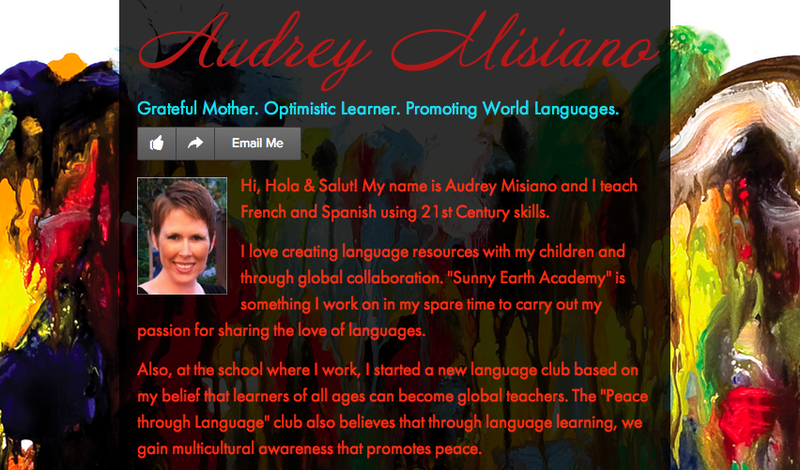 My name is Audrey Misiano and this is my new blog! My good, friend +Sylvia Duckworth, recommended that I try out Blogger, so here I am! This blog will be a space for me to share my adventure in transitioning from language "learning" to language "acquisition"! To read more formally about this shift, please visit my blog post "Language Shift: From Learning to Acquisition". To see more about me, visit my splash page here. I hope to write about what is happening in my classroom AND at home with my children whom I am raising bilingually in French/English (although my husband is monolingual and I am a non-native French speaker). This year I'll be teaching French 1 and Exploratory Language (French and Spanish). Feel free to email me with questions or comments or ideas! Audrey, this is great! Congratulations! I look forward to reading some of your pieces! I have learned a lot my watching your videos in both French and Spanish. I am using some of your ideas to help my students with trouble spots.